This incredible Antarctic cruise expedition surely fits the ‘once in a lifetime’ brief. 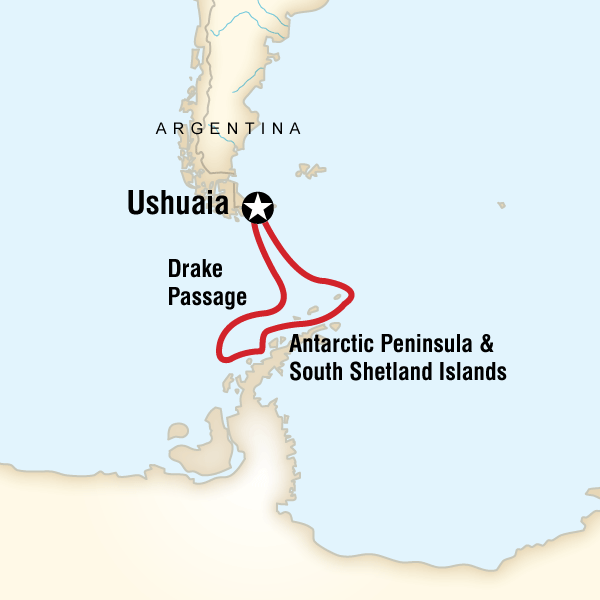 Join a maximum of 140 other passengers onboard the M/S Expedition as you embark on a two week round trip from Ushuaia via Drake Passage, the South Shetlands and time spent on the Antarctic Peninsula. Whilst onboard you’ll be invited to listen to lectures, chat to Antarctic experts and read a range of relevant literature prior to turning your newfound knowledge into first-hand experiences. From ice floes and huge glaciers to languid leopard seals and chattering penguin rookeries, there’s nothing like life in Antarctica to set your mind and body racing with opportunities. Responsible Cruising: Our M/S Expedition ship is built with the environment in mind, exceeding industry regulations. With a maximum size of 140 passengers, the M/S Expedition offers space and comfort, whilst also ensuring that impact to the delicate environment surrounding it is kept to a minimum. Penguin Rookeries: You'll have the chance to meet and greet various types of wild penguin, including Gentoo and Chinstrap varieties, whilst learning about the wildlife and the impact of global warming on the surroundings and the penguins' lives. Dollar-a-day program: You are given the opportunity to give back to people visited on our tours through our Dollar A Day system. Simply give a dollar for every day you are in and around the Adriatic (we'll give you the opportunity to do this at the booking stage) and 100% of this will go towards conservation projects worldwide through our foundation. While none of our projects are currently located in the Adriatic, you'll enjoy your tour even more knowing that you're doing your bit to help those less fortunate worldwide.